The Homeopathic Apothecary Mouse is a breed of mouse found in the Moussu Picchu. This tireless alchemist is constantly brewing strange concoctions and inventing new experimental formulas. Among his scattered notes are recipes for topical creams, energy drinks, cheese flavour enhancers and a very fine ginseng tea. A few of the more recent pages imply that he managed to synthesize something that defies the laws of thermodynamics, but it... escaped. His preceding notes all seem to be focused on finding a method to build the impossible collection of the preserved essence of every living thing on the planet, and early drafts of a really big vessel to carry them all. 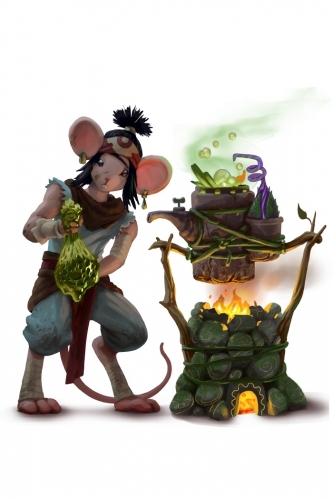 The Homeopathic Apothecary Mouse has been found to be especially attracted to Glowing Gruyere Cheese, to the point that any other kind of cheese will simply not suffice. Only Shadow, Arcane and Draconic type traps are effective against Homeopathic Apothecary Mouse, all other power types are ineffective. 6 September 2017: The Homeopathic Apothecary Mouse was introduced as part of the Moussu Picchu release.